A retrospective insight on two rival games that brought platforming into the new millennium. Earlier this week, I elaborated on the rise and fall of Crash Bandicoot as foreshadowed by its third installment. But in the wake of a certain recent Kickstarter, I’ve decided make this an occasional column to use 1998 as a pivot for discuss game design and development history. 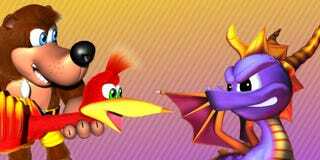 And what better place to start than with arguably the biggest gaming rivalry of that year: Spyro the Dragon and Banjo-Kazooie. As a forewarning, I’m nostalgically biased toward Spyro. I was three when these came out, and my house had a PlayStation instead of a Nintendo 64, so Spyro 1 was the cornerstone of that console generation for me. On the other hand, a cousin of mine had Banjo-Kazooie, so I had witnessed enough of it to warm me up to it, even if it wasn’t much. To prepare for writing this, I replayed both games, as well as Spyro 2. And in experiencing these two surprisingly different series, I found points to bridge not only the game feel, but the entire way they represented their consoles’ strengths and weaknesses. One of the interesting legacies looking back is the fact that while Banjo beating out Spyro in sales followed a trend of big N64 games beating out their PS1 rivals, PlayStation as a console still got the edge in the end. But before we delve into that subject, let’s look at how these games were built with the consoles in mind. Spyro was conceived for panoramic environments. Even though it was stylized, and the camera was just as close as a typical third-person game, immersive realism was the goal. In that sense, you could call it a launch title three years too late. The first aspect is that the skies for each level were developed with thousands of non-textured polygons that wrapped around a sphere, and it was dubbed the “Cyclorama Engine”. Crash Bandicoot showed years earlier that PlayStation games could get away with this because A) the console could draw a lot more polygons without textures, and B) polygons are easier than textures to rely on for showing details on a low resolution. Banjo-Kazooie, on the other hand, focused on ground-level interaction. The camera was expected to face downward for most of the time, so most anything above an arbitrary height was sacrificed to allow resources to be moved elsewhere. Resources, incidentally, needed to be handled more carefully. The N64 was notorious among developers for having a tiny 4KB texture budget per frame, which meant that different games needed to cope with those limits in different ways. Because Rare were more experienced in developing for this console, they were able to develop tricks to maximize use of that budget. Another thing that Crash proved was that games with a fixed camera visually benefited a lot more than free-roaming games, because they could take advantage of optimizations like occlusion culling to anticipate and maximize the detail each section of a level could have. As a result, both Banjo and Spyro are comparatively lacking in detail because there’s a lot more space shown at once, but each game’s engine has a technique to overcome this. 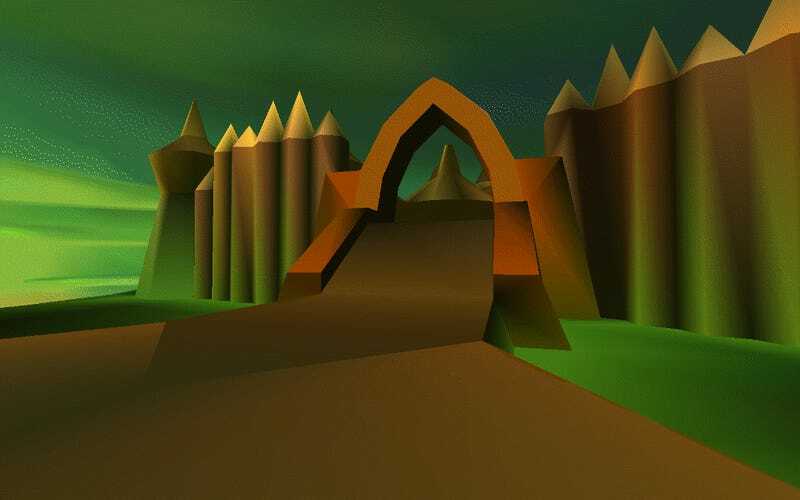 In Spyro’s case, helping the panoramic goal, each level was developed with multiple levels of detail, including two polygonal levels of detail and two stages of mipmapping on top of pre-baked colored shading. These were then calculated using assembly routines to fade based on distance. Because the PlayStation’s GPU couldn’t handle Z-buffering, it was all custom-built taking into account the small resolution. To compensate for the colored shading, the actual textures were made relatively desaturated, balancing the aesthetic. For Banjo, smart textures and smarter calculation made all the difference. While level of detail wasn’t implemented as thoroughly, Rare took advantage of the fact that a faster number of draw calls, rather than higher number of polygons, was what mattered for the N64. The 4KB texture budget was pushed to its limits by splitting larger textures into smaller pieces, which avoided repeating textures for the most part. At the same time, Rare was experienced enough to be able to develop a memory management system that not only shuffled visible elements in and out, but made sure they didn’t fragment or leak. Gameplay is where the biggest similarities begin and end. Both titles are character-driven free-roaming platformers focused on collecting things, and they draw much of their inspiration from fairy tales. And that’s about it. Banjo-Kazooie followed closely behind the formula set by Super Mario 64, with power-ups, puzzle challenges, arbitrarily-limited gates, and enemies that damage Banjo upon contact. Textual dialogue between characters is frequent and mostly unobstructed, while each situation takes advantage of all kinds of spells, items, platforms, and surfaces. The expansiveness of these mechanics extended playtime by making the game itself packed with variety. Spyro the Dragon starting out stripped things down to basics. 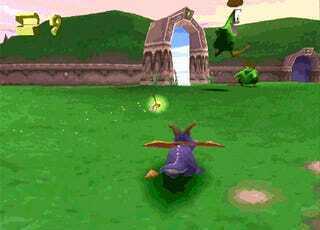 Spyro himself merely has a static set of moves, including charging, flaming, and gliding. Each of these were tailor-made to feel natural alongside a shallow-angle active camera. Unlike the resourceful Kazooie, Sparx the dragonfly acted merely as a health meter and gem magnet. Power-ups were limited to superflame fairies and supercharge ramps, and only certain levels were designated for full flight. The difference is that the enemies were designed to be both interactive and varied in how to fight them. They wouldn’t just brush a hitpoint off, they would throw projectiles or swing a long pointy stick. And unlike most games, even Banjo, the AI was just a step high enough for persistent idle interactions with each other. They say sound is more than half the experience, and this no doubt applies to both our specimens here. Sound effects are par for the course, but the music gives the games completely different atmospheres using different techniques. Spyro’s soundtrack was developed by Stewart Copeland, who is of course best known as the co-founder and drummer of The Police, but was at the time 15 years into a solo career as a composer and just coming off Good Burger and Gridlock’d in the previous year. Spyro was his first video game score, but he treated it as quickly and effectively as his quickie TV assignments. He was assisted by his longtime drum techie Jeff Seitz. Each level used a track that was a self-contained song, but packed with inner complexity to avoid listener fatigue, as well as balance between atmospheric and dynamic feel. The final tracks were just shy of normal CD quality, enough to be packed into the disc. And because Copeland often reuses ideas from past projects, Spyro shares melodic heritage with the likes of The Pallbearer and The Amanda Show, among others. The rest of the game’s sound was handled professionally by Universal Sound Studios, including curating sound effects in the same manner as Crash Bandicoot, and recording top voice talent like Carlos Alazraqui (Taco Bell Chihuahua) and Clancy Brown (Dr. Cortex and soon thereafter Mr. Krabs). Banjo-Kazooie’s entire music and sound design was handled by Grant Kirkhope, who was a Rare employee about as close to the development as a composer can get. He started out as a trumpeter and guitarist in various UK bands, then rose the ranks of Rare composers for the first couple years before being handed what was originally called Project Dream. Because each N64 cartridge was small in comparison to CDs, audio had to be compressed and handled using glorified MIDI, much like even Crash Bandicoot had to resort to considering how much memory was taken by other things. So to add variety, each level had multiple tracks with simple construction but different instruments. That way, individual areas and even underwater travel all came with a fresh flavor of the same upbeat melody. These same limitations also influenced the voices of all the characters. Smaller bits of grunts, trills, and other such utterances strung together created a new, distinct language of dialogue for the game’s universe. Kirkhope, joined by lead programmer Chris Sutherland and Conker designer Chris Seavor, spent a long time getting all those tiny vocalizations just right. As far as the first games were concerned, they were almost completely independent in thought and development. So a couple odd coincidences stand out here from when they started out. The memorable intro to Banjo-Kazooie, which came out months before Spyro did, leads off with a buzzbomb smacking straight into the Rareware logo and dropping into a pond. A buzzbomb is basically a giant dragonfly, which means that intentionally or not, Rare preemptively threw a middle finger to the relatively meager effort of Insomniac released later the same year. What would follow the next year proved that Insomniac definitely took the bluff, throwing into their next game a bunch of ideas borrowed from Banjo-Kazooie: special challenges, locked gates, altered power-ups, and new collectibles. While critics and fans lauded the changes made, sales actually went downward over the next two Spyro installments. In the meantime, Banjo-Tooie came out, and blew the doors wide open. The battle was over, and Insomniac moved on to a new series on PlayStation 2 that could hopefully redeem their integrity. But by the time it came out, Rare retreated into the umbrella of Microsoft and simmered until now, basically. Spyro, in the meantime, went into a few phases under new management, and is currently residing in the Skylanders money pit like how Rayman once resided in the Raving Rabbids money pit. But also going on now is the launch of a brand new game from the same creators of the Banjo series, that promises to get back to the roots of platforming. And the second character in this dynamic duo is a bat that... curiously looks... familiar. Spyro level of detail montage made in part using SpyroWorldViewer.